Inspired with a blend of style and substance, designed specifically for Apple, the latest Groove X series for MacBook brings new meaning to the world of carry. 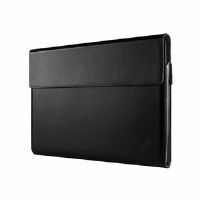 Carefully chosen with high quality two-tone cross dyed polyester, the Targus Groove X Slimcase intends to protect up to 13" MacBook Pro with Retina Display. The case is with water resistant finish and with wear- and water-resistant bottom. It provides the perfect solution for someone looking for a protective, yet compact and light case. 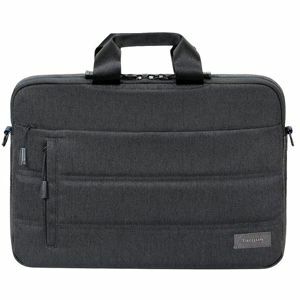 The case features a 13" padded cradle with velvet anti-scratching lining, which allows easy slide in and out and free from dust or scratches. In addition, the MacBook is protected by the foam padding around the edges, to prevent damage to the sides and corners. 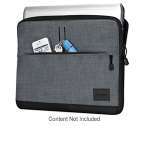 Documents and/or iPad can be stored in the main pocket. The front stash pockets with advanced workstation, and the back filing pocket provide convenient storage. This case also features a hide-away & secret pocket. It is designed to neatly keep the double handles when not in use, or to be used as a small storage pocket with a secure button closure. The Slimcase can be moved around multiple ways: using the hideaway carry handles, or the detachable shoulder strap, or secured on a trolley.